At the time of the American Revolution 1775-1783, many inhabitants of the thirteen colonies were loyal to the King, George III, and took up arms on Britain’s behalf. During and at the conclusion of the War, most of these “loyalists” were forced to leave. Of these, some 40,000 or more came to what is now Canada, and over the following years, greatly influenced the character of much of our country. 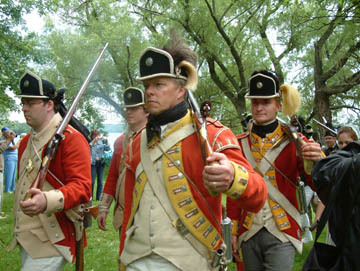 In 1784, many Loyalists settled along the St. Lawrence River and the north shore of Lake Ontario, from Prince Edward County to near Montreal. Kingston was one of the main settlements in that line of new settlement. In the 1884 centennial of their arrival, Loyalist celebrations were held across the province and proved to be the genesis of the Loyalists’ Association of Ontario some years later. From that evolved the United Empire Loyalists’ Association of Canada (UELAC), formally incorporated in 1914. Kingston Branch (officially, “Kingston and District Branch”) is one of twenty-seven branches across Canada, from Halifax to Victoria. Some people wonder “why the Loyalists matter”. One response to that question can be read here. The Colonel Edward Jessup branch is having their Annual Spring meeting and luncheon on Saturday, April 27th. Details here. On Friday, May 10, we’ll have a table at the Kingston Regional Heritage Fair at McArthur Hall, Queen’s West Campus. If you’re there with a student or class, stop by and say Hi. To join Kingston & District Branch UELAC, simply fill out the New Member Form and bring it to the next meeting or mail it in. You are welcome! Join us on June 12th at noon across from Kingston City Hall on Ontario Street, when we raise the Loyalist Flag to commemorate Loyalist Day in Kingston.